School of Freshwater Sciences researchers are internationally recognized for their expertise in using genomics to address pollution concerns in freshwater. They are at the cutting-edge of a field that will drive water management best practices and inform domestic and international water policy in the 21st century. 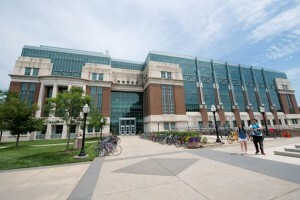 The Great Lakes Genomics Center’s research is central to all phases of freshwater protection and management — measuring biodiversity and ecosystem health; managing sustainable supplies of clean freshwater for human consumption and recreation; developing more efficient tools for monitoring, treating, and reclaiming water; and mitigating the impacts of pollution, climate change, urbanization and other stressors.